One of NASA’s primary objectives, and the one which most excites the general public, is the search for evidence of life elsewhere, whether in our own Solar System or on some distant exoplanet. However, the best way to go about that is a subject of much debate. 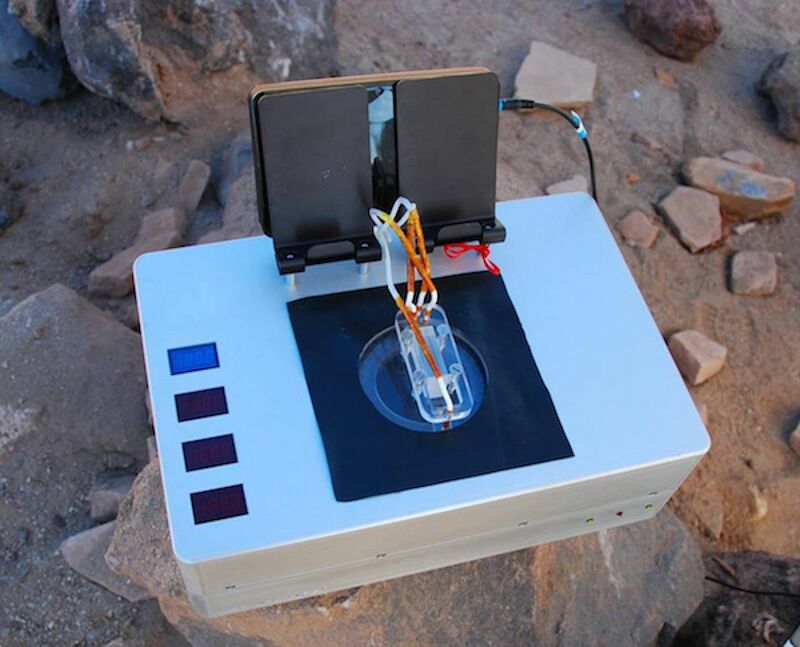 Now, researchers at NASA’s Jet Propulsion Laboratory have come up with a new proposal: a “Chemical Laptop,” a miniaturized portable laboratory which would look for signs of materials associated with life (at least as we know it), such as amino acids. “If this instrument were to be sent to space, it would be the most sensitive device of its kind to leave Earth, and the first to be able to look for both amino acids and fatty acids,” said Jessica Creamer, a NASA postdoctoral fellow based at JPL. The device would be about the size of a laptop computer, but thicker, containing a set of complex analytical components inside. It could be likened to a “tricorder” device from Star Trek, an even smaller on-the-go laboratory as envisioned back in the 1960s. But while a tricorder could simply be pointed at a sample to analyze it, the Chemical Laptop would need to ingest a sample first, similar to how samples are analyzed on Mars rovers and landers. Currently, it can detect amino acids as low as parts per trillion. The device would be sensitive enough to tell the difference between amino acids which originated from biological sources and ones which did not. So how does it do that? There are two kinds of amino acids, left-handed and right-handed, which are basically mirror images of each other and contain the same organic components. They are also the same size and equal in electric charge. On Earth at least, life tends to use only left-handed amino acids for reasons which still aren’t entirely clear to scientists. However, life on a different planet or moon might use right-handed amino acids. If an excess of either left- or right-handed amino acids were discovered, that would be good evidence for life. Scientists would also examine the length of the amino acids’ carbon chain, which could provide clues as to what type of organisms the amino acids came from. So just how does the Chemical Laptop work? The device is battery-operated and, unlike the rovers or landers, requires a liquid sample to analyze with its instruments. This is more difficult on a dry planet such as Mars, so engineers collaborated with JPL’s Luther Beegle to devise an “espresso machine” technology, where dry samples are put into a tube with liquid water and heated to more than 100 degrees Celsius (212 degrees Fahrenheit). When the water later comes out of the tube, it carries any organic molecules with it, which can then be analyzed. The Sample Analysis at Mars (SAM) instrument suite on NASA’s Mars Curiosity rover also heats samples in a similar manner, but without water. The wet samples are then mixed with fluorescent dyes; the dye attaches itself to the amino acids or fatty acids in the sample, which then flows into a microchip where the amino acids and fatty acids are separated from each other. A laser at the end of the separation chamber detects the different amino acids as they pass by. Chemical additives inside the microchip then mix with the samples. Some of the additives will only react with left-handed amino acids and other only with right-handed amino acids. Since these additives will change the amount of time the amino acids are in the separation chamber, scientists can then determine the “handedness” of the amino acids in each sample. 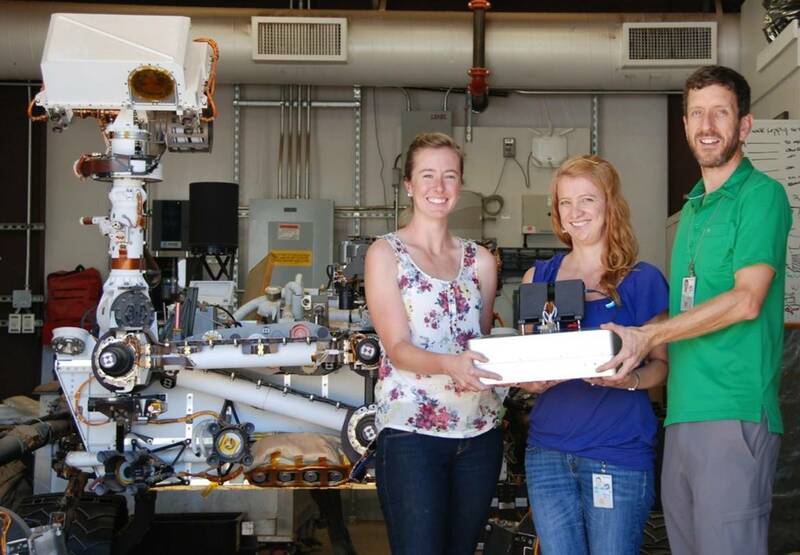 The first field test was conducted last year at JPL’s Mars Yard, where a Chemical Laptop was placed on a test Mars rover. “This was the first time we showed the instrument works outside of the laboratory setting. This is the first step toward demonstrating a totally portable and automated instrument that can operate in the field,” said Mora. “One ultimate goal is to put a detector like this on a spacecraft such as a Mars rover, so for our first test outside the lab we literally did that,” said Willis. So where in the Solar System would be an ideal place to use a Chemical Laptop? There are several, starting with Mars of course for one. 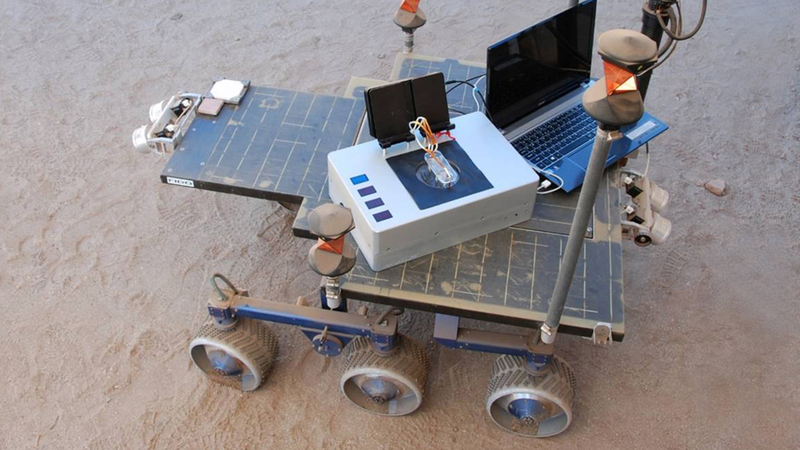 While Curiosity, Opportunity and other rovers and landers can analyze rock and soil samples for organics, they are limited in comparison to what this other portable laboratory could do. Organics can be detected, but only to a certain complexity, and those instruments can’t differentiate between biological or non-biological amino acids (or other complex organics). Since early Mars was much more hospitable to possible life than it is now, it is necessary to be able to do this, if any solid clues as to past life are to be found, if they exist. Jupiter’s moon Europa is also an ideal location to use a Chemical Laptop. If a probe landed on the surface, as many scientists would like to do, it could study samples of the ice and rock; if any material is able to make its way to the surface from the subsurface ocean below, as is considered possible, it could be analyzed for any possible organics. It also then would not be as necessary to attempt to drill through the ice to the water below, a much more daunting task for further in the future. A probe with a Chemical Laptop could land near one of the many large fissures in the icy surface, where it is thought that material from the ocean below can rise up and be deposited, just sitting there waiting to be studied. There are also possible water vapor plumes on Europa which could be studied like those at Enceladus (see below), but they haven’t been confirmed yet. A new mission to Europa, consisting of multiple flybys and, according to some reports, a possible lander, is now in the planning stages. The situation is similar for Saturn’s moon Enceladus, where water vapor, already known to contain organics, blasts out into space through huge fissures in the icy surface at the south pole called Tiger Stripes. 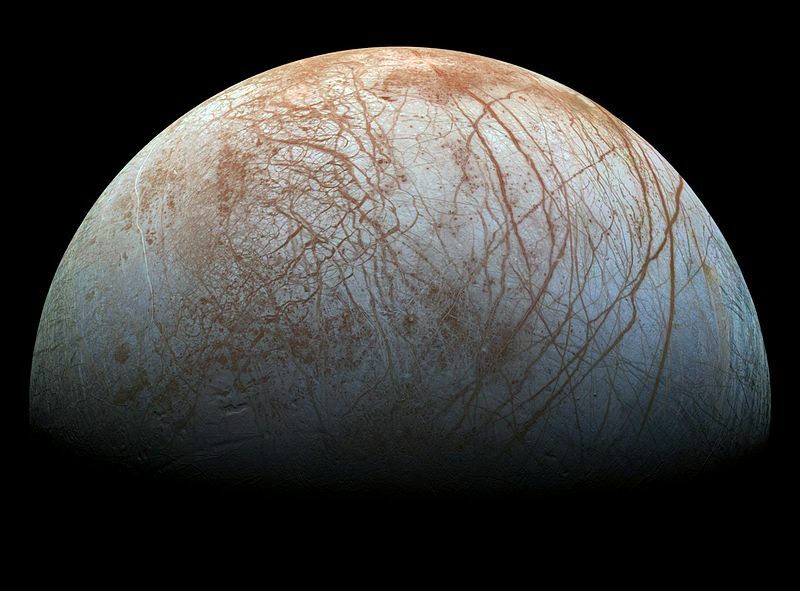 As with Europa, the water vapor geysers originate from a global subsurface ocean and deposit ice particles, organics, and salts on the surface, which could potentially be analyzed. The Cassini spacecraft has already flown through and sampled the plumes themselves, finding water vapor, ice particles, organics, and salts. Data from Cassini has also provided evidence that the seafloor of Enceladus is hydrothermally active, similar to on Earth, making it an environment potentially well-suited for life of some kind. “This could also be an especially useful tool for icy-worlds targets such as Enceladus and Europa. All you would need to do is melt a little bit of the ice, and you could sample it and analyze it directly,” Creamer said. Another ideal place to use a Chemical Laptop would be Saturn’s moon Titan. The surface of Titan is literally coated in organic material, as well as having lakes and seas composed of liquid methane/ethane and an organic-rich, thick “smoggy” atmosphere. While Titan is much colder than any place on Earth, and inhospitable to Earth-type life, there is thought to be pre-biotic chemistry which can be studied for clues as to how life originated on Earth. Some scientists now even think that exotic types of simple microscopic life, perhaps methane-based, could be possible in Titan’s harsh environment. If so, it would be unlike anything seen on our own planet. Comets and meteorites are also known to sometimes contain amino acids. These would also be an ideal place to test and use a Chemical Laptop. While such amino acids are thought to be originate exclusively from non-biological sources, they could be studied in-situ in much great detail than they can now. 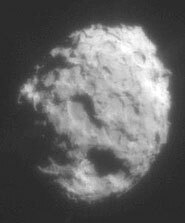 The first amino acids in a comet were found in samples from the comet Wild 2 by NASA’s Stardust mission, which flew past the comet in 2004. It was also recently reported that amino acids discovered on the Moon by Apollo astronauts are most likely contamination from Earth. Interestingly, further analysis showed them to be left-handed, so likely having a biological source, but since the Moon is so inhospitable to any life we know of, it is thought they must have originated on Earth. Another test is upcoming in the Atacama Desert in Chile, with collaboration from NASA’s Ames Research Center at Moffett Field, Calif., through a grant from NASA’s Planetary Science & Technology Through Analog Research (PSTAR) program. New technologies such as the Chemical Laptop should help scientists to finally answer some long-standing questions about the origin of life, both here on Earth as well as perhaps elsewhere in the Solar System. Life exsists only on Earth. Life is unpossible on other planets.